Disclaimer: All you have to do, is merely spend 5+ years and thousands of hours writing and then stuff starts to arrive. This is my second swimming watch review this year, and for this one also I did not purchase the watch but it was supplied by the manufacturer Swimovate. No conditions were requested, no guarantees were given other than I would be as always, fair and honest. As usual, my reviews are based on continuous extensive use rather than immediate impressions. I liked the original Swimovate Poolmate v1 and it was one of, if not the first reviews on this site (and I paid for that watch myself). I’ve used it continuously since. It had flaws but in general it did what it aimed to do. Over six years of frequent pool use and changing the battery myself every six months, it has recently accelerated toward its looming demise. Segments on the LCD have stopped working, and the strap is cracking where it was bent to insert into the catch. The plastic face was quite scratched and crazed, but still usable. It may have lasted three months more or it may have lasted a year but its end was approaching. So it was unexpected when Swimovate asked me to review the second generation iteration and explaining that the second version now had an open water capability. The RRP on the Swimovate Poolmate2 is £70, but cheaper on Amazon (link below). One of the main flaws of the original Poolmate was its short battery life. As I said above, and my original review stated, the battery seemed to last six to nine months, which is very short for a digital watch and not even the year originally stated. It had additional functions like calorie counting, stroke counting and efficiency monitoring, added to the standard time, stopwatch-like time and lap counting. But honestly, almost everyone bought it for the lap counting. While I and others would advise the first step in tracking your swimming is to use the lap clock, it’s also true that at least for this distance swimmer who swims in an odd length pool, that the lap counting function was invaluable. Prior to the Poolmate v1, I tried many techniques and tricks to track distance, from mental gymnastics to using the lane floats, even to making a simple abacus for sets. Not every set is repeat 100s and sometimes, even when it is, a lone swimmer can need a tool when their mind refuses to co-operate. Swimovate say that battery life has been significantly improved for v2. This is the one item I can’t test immediately, but my reviews never go away and I will update as appropriate. I have no reason to doubt this, as I imagine plenty of people sent the watch back for battery changes that Swimovate would want to reduce. The pool functions of the v2 remain, with the addition of a Speed function. The LCD display is changed and slightly larger than v1. Instead of being a smaller number on top of the LCD, the lap number has moved to the centre and been enlarged. It’s certainly clearer out of the water. In the water, because it’s a digital readout, underwater legibility will always be conditional on ambient light (I check on a flip turn underwater). I do think the new layout is better though. The watch tracks Total Time, Rest Time, Distance and Lengths, as well as individual Sets. After years of using the first version, I no longer even noticed functions such as Stroke and Efficiency and Speed so it was good to revisit and reuse them. The Poolmate v2 stores up to 50 different swim sessions (not differentiating between OW and pool). Stroke keeps track of average strokes per length (pool length is customisable down to 18 metres, as are units to the antiquated imperial measurements, and body weight for the calorie estimation) and Efficiency. The Efficiency function is a product of time, distance and stroke count, essentially replicating the common swim technique game of SWOLF (swimming golf) where the swimmer must find their own optimum balance between stroke turnover and speed. Revisiting the Efficiency readout in particular was useful to improve a couple of recent swim sessions. Swimovate include in the manual a scale for efficiency readings, such under 30 is Excellent (Professional), 30 to 40 is very good and 40 to 50 is above average. Using the Efficiency setting will undoubtedly assist swimmers in focusing on this area of technique, and if like me you haven’t done so for a while, it’s good to revisit and change your regime. For what it’s worth, and recalling that I usually describe myself as an average swimmer, my Efficiency is largely unchanged, ranging from 35 to 38 for the pool, the low number for sets where I am really concentrating and the high number where I might be doing a longer distance with less concentration. We will see further on the Efficiency comparison with open water. (My Efficiency can drop to 33 if I am using power paddles and a pull-buoy). I am though a higher stroke rate swimmer. If I was swimming with a friend like Ciaran Byrne, who is virtually the same speed in most situation, Ciaran’s typical stroke rate is 64 spm versus my 71, so Ciaran is the more technically efficient swimmer whereas a stroke rate of 64 SPM would quickly lead to me being hypothermic in open water. Speed is tracked in seconds per 100 (metres or yards). This is quite a useful feature for repeat sets of intermediate or longer distances. There is also the addition of a Rest time tracker. This is useful when reviewing long sessions if you really want to see how much you were slacking off. I particularly would like this for the 10k+ long pool sessions where rest periods are nearly always longer than you think. The Log can allow you to review the individual sets of previous swims. You WILL need to read the short manual to figure out how to review Logs and Sets but once you are familiar with it it’s fairly straightforward. Lap counting is done via an accelerometer. The watch can be set to use either arm. I have read criticisms of v1 over its lap-counting accuracy but I never found it to be the case, and I swum hundreds of thousands of lengths with it. If your turn glide is too short, it won’t count accurately, so fix your turn. I don’t recall that all these functions were present in v1, and they really add to the tracking capability of the watch. For those of you doing longer training, and sessions, the Log function is actually quite useful to review your performance or for adding detail to personal training diaries. The most requested feature or repeated criticism of the v1 Poolmate that I heard was its inability to provide any open water details. Personally, my own mindset changed over the years from initially wanting a disance measurement, to now preferring a somewhat more unfettered swim, where the only important measurement is time. Poolmate2 addresses the distance tracking in an interesting fashion. Lacking any more expensive GPS facility and since there’s no length or method to determine fixed lengths, Swimovate utilises the accelerometer and a personal calibration swim to determine distance. What that means in practice is that on your first use, you swim a known open water distance. The watch tracks your time and strokes, and you enter the actual distance. This will result in a personal distance travelled per stroke reading. (The default on the watch is 2 metres per stroke). The constraints here are the requirement be able to find a fixed distance greater than 50 metres and to swim it straight (though Swimovate don’t mention this or not swimming initially in choppy water, which I’d advise against). Finding a known fixed distance can be done with Goggle Earth but someone who only has beach access with no distance measurable points may need to travel to a lake or rocky area to find a location. I simply swam from the Guillamene steps to the rock outside the long-collapsed Uaimh na gCapall cave and back on a flat day, a distance of 366 metres and 241 strokes. I doubt I varied off the line by more than a metre, since the water was flat, the distance short, and I know the area well. If you are a new or intermediate swimmer whose fitness, stroke length, stroke rate, distance per stroke or skills in navigation are changing, you will need to recalibrate the watch occasionally to update the distance measurement accuracy. So the calibration swim resulted in a distance per stroke of ~1.52 metres, quite significantly away from the default of 2 metres and I imagine the majority of people will be similar to my distance or less (Mr. Average Swimmer). The Efficiency reading for that is 44, compared to my usual pool efficiency of ~36/37, showing the effect of streamlining off walls. The OWS function also includes the Speed for 100 metres (or yards). Distance, Total number of Strokes, Rest time (but remember if pausing the watch in swim you must press the buttons above the water’s surface) and Calories. I think it’s fair to say, though I’m certain Swimovate would not do so, that this is an intermediate or possibly even kludgey solution for open water. If you want to measure distance accurately, as Swimovate point out in the manual, you need a GPS. And GPS doesn’t currently come in watch form for £70. So the Swimovate is a tradeoff of price and accuracy. So the important question is, well how does it fare in open water? In short, quite well. I’ve tried it in a number of conditions from flat to two metre waves and Force 3 to 4 winds. You understand that based on the above setup, the watch has been told what distance your stroke will take you. The Efficiency won’t always be the same however, because your time will vary and it will for almost all of us be higher than the pool. An example test swim was my usual Guillamene to beach and back. Straight line distance is about 1850 metres to my normal turning point, so 3700 metres total. This swim had normal variability off the direct line that everyone will take, plus a short stretch where there is an eddy and in choppy water. 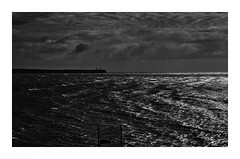 The watch read 3922 metres with 2668 strokes. Did I swim 200 metres offline in total? Some of it would be explained by off-the-line swimming but I highly doubt it was all the difference. The critical difference is: it was choppy water. This would have reduced stroke length and increased overall time. The percentage difference is only 6%. For most swimmers though, accurate tracking over multi-hour swims is not a concern. To contrast with my pool swimming, my open water Efficiency was 47, 10 higher than in the pool. Over the course of a several different swims in different conditions, Efficiency varied between 45 and 48, significantly higher than the pool. This did have the beneficial effect of making me think more about my stroke in the sea that I usually do. There is also a speed counter, which I have to admit can be somewhat dispiriting also. Checking my speed over many pool sessions, especially sets of multiples of 100 metres, showed my 100 metres repeat pace exactly as I expected from the pace clock, between 1:35 and 1:38. However in open water my 100 metre pace is slower, coming in at 1:48 to 1:50, something I’ve not previously measured accurately. (I feel it necessary to defend myself and say I’m really off-form at the moment!) But I imagine that if I were properly trained I would only improve by a two or three seconds per 100 at best). As such the SPEED function operates like the pool pace clock, taking away any preciously held self-delusions and confronting you with the reality of your real open water pace. And in the long view, that can only be a good thing. The watch is rated at 50 metre depth resistance. While I like the security of 100 metres depth resistance for peace of mind, in practical terms I haven’t had any problems with 50 metres depth resistant watches, and I am certain I put any watch through a tougher testing regime than anyone else, given my predilection for swimming in rough water. And a 100 metre water-resistant watch will usually require that the battery be changed in a pressurised chamber. I previously purchased the black v1 and it’s looking fairly worn after years of use, but to be honest, nothing tests any product like using it around water, and for £65 as I paid back then, to get so many years of use seems quite reasonable. Of the four available colours, Swimovate first sent me a grey version and later a blue v2 to test. During the course of testing the v2 grey watch, I discovered a software bug on distance tracking for open water. I notified Swimovate and they immediately replicated and fixed it and sent me out the blue replacement, on which this review is based. I would not have chosen blue myself, but then to it immediately. Should you have received an early watch which has a problem with distance tracking in open water, Swimovate will update the software for free. They’ve since told me that they’ve had no feedback on the bug, which only displayed after more 999 metres . I don’t even understand how people can be buying an open water watch and yet not swimming more than kilometre. I swam two miles on my very first open water swim before I had a clue what I was doing. I haven’t seen the white on black reverse display version except online so can’t comment on what that is like in underwater legibility. The face is plastic as was the previous version so it will scratch. But my v1 had multiple collisions with was steel lane ropes and lane floats and survived them all so I expect v2 to perform similarly. The calorie counter is no better nor worse than any other I’ve seen and I dislike them in general. I’ve told Swimovate that I believe calorie estimates for pool swimming are generally too high and too simplistic being based mostly on weight. Given swimming is an appetite stimulant, new swimmers might believe they really are burning 800 calories per hour when swimming low intensity sets when they may only be using 400. There are a range of factors influencing calorie consumption in swimming, including height, weight, stroke rate, intensity, experience, stroke type, fitness level and of course, water temperature and whether you are wearing a wetsuit or not. So my advice is to disregard the calorie counter and certainly don’t based a daily calorie plan around it. Since the v2 Poolmate can now be readily used for both pool and open water, it’s likely that people will wear it constantly. The watch however doesn’t have a light, something that’s a more obvious flaw as ironically the utility of the second version has improved. Swimovate tell me this was choice they had to make to sacrifice the light for the improved battery like. I also find the watch somewhat chunky and wish it were a bit slimmer, but it is in balance very light. There is as yet no perfect open water swimming watch. You can buy watches with different features, whether GPS, thermometers, heart monitors, barometers or computer connections and stroke counters or 100 metre depth resistant. What you can’t yet get is a watch that does all of the above, affordably and in a slim package. So your main choices available are based on personal requirements and cost. I recommend the Swimovate Poolmate2 as an excellent and versatile and affordable watch for both pool and open water swimming. I used the first one and was very happy about it until I lost it in the locker room. 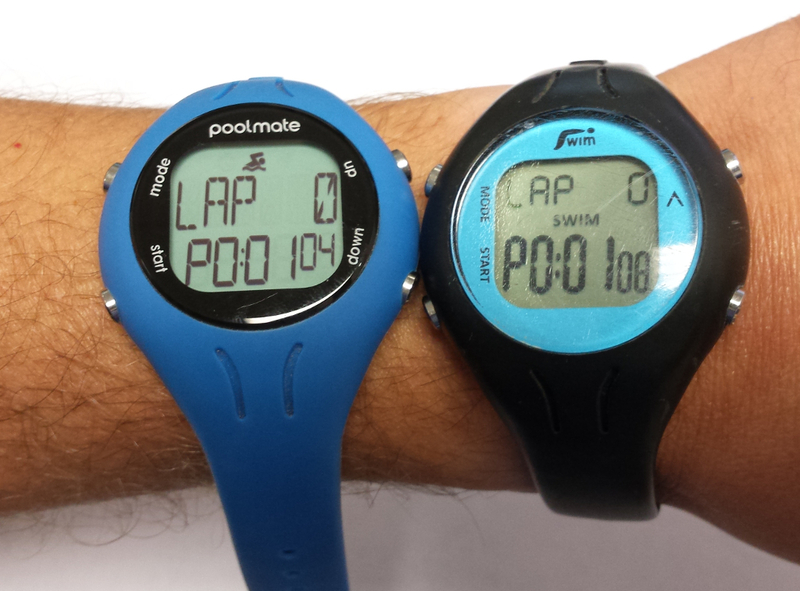 I bought the Swimovate Poolmate2 – but it is rubbish and I am fed up setting time. it reverts back to jan 01 for some reason. I thought I could see the laps in the water but screen is small and dark. Hello Loneswimmer, Thank you for the review (and for your inspiring blog posts!). I’m thinking of buying one of these watches to count my lengths and track distance swum, as I am training for a long swim. I use several different pools, of different lengths. I assume this means I have to “tell” the watch “I am now at the 25m pool” or “I am now at the 50m pool”? Is that right? Will this be a problem do you think? Yes, it’s easy to change the pool distance. You can’t preset say a 25m and 50m (I’m jealous, we only have three 50s in Ireland and the nearest is almost 20 hours away) but you just adjust the distance up or down, and it’s quick and easy. Thanks Loneswimmer, ok that helps. I’m in London so we have the Olympic Aquatics Centre, 50m, and the marvellous Tooting Bec lido, 100yards long. But mostly I use the local pools 25m and 33m. Thanks for the info. Got my Poolmate 2 yesterday and excited to give it a try this morning. INstructions read and arrived early doors this morning to give it a test flight and not 20 lengths in display started flashing and displaying gobbledegook. Looks like water has got in. Very disappointed to say the least, Christmas present to myself. Now to see if Outdoor GB are any good with customer service. Bad luck Keith. My first Poolmate V1 water got into it. Swimovate replaced it, and I’ve had no problems since for the past six year. I do know that if you press the button underwater water can get in also. Thats one of the first things in the manual. I pressed it on the poolside before even getting into the water. Hopefully just one of those things. Hope i dont end up with a fight on my hands, we shall see. Well let me know if you run into difficulty and I may be able to help. Update for you while I remember. Watch replaced straight away with no hassle. Even spoke to the designer/creator of the poolmate2 and what a nice chap. One thing I have noticed is that your picture shows clear background and black digits. My poolmate2 has a black background and clear digits. There is nothing in the setup to change it. I would prefer it like your picture. Am I missing something? Good to hear Keith, my experience with repairs back to them was similarly positive. I just checked Keith, and I assume you have the black one. According to the website, the black comes with a reverse display and no backlight. No neither yours nor mind can be reversed. Thanks for the review. If you guys want to have a little more functionality maybe the XMetrics or the Finis Swimsense are products to consider. Of course the Garmin swim is also a good device (from my point of view). I haven’t used an Xmetric or Garmin, which has always been over-priced, and I can say with certainty that the Finis will be junk, because every electronic product Finis have ever made is rubbish, with terrible reliability and interface. They are in fact possibly the worst quality of any swim manufacturer… in the world. BTW, I’m happy to allow your link to appear here, if you reciprocate. This will unfortunately be useless in measuring distance in any situation where there is a significant current. Admittedly distance in such scenarios is reduced to a purely geographical metric and not one with an meaningful connection to swimming, so possibly not a great loss. I wouldn’t say useless though having tested it with following winds and tides. Granted it wouldn’t be a logical solution for example, if you calibrated it in calm flat sea, then swam down a river with it. But then as I say, if you want a greater degree of accuracy, you need to spend more for a GPS or SPOT tracker. I also had the original Swimovate v1. I liked it and used it in my odd 15-m length pool in Moscow. The LED display started to go within the first year, to the point where I couldn’t see the important data, namely lap #. It was out of warranty so I put it to the side in the junk pile. Thanks for your review. How do you think this product stacks up agains the Garmin Swim? I have never had the opportunity to test the Garmin Swim, so I can’t compare.